I previously discussed the pros of owning a mini pig, so it’s time to discuss mini pig cons. While we love and adore Oscar, not every day with a pet mini pig is easy. The benefits of owning a mini pig outweigh the cons for us, but that might not be the case for everyone. In sharing both our positive and negative experiences with Oscar, my goal is to help you decide if a mini pig is right for you and your home. Here are some mini pig cons based on our experience with Oscar. 1) Noise. The toughest part about owning a pet mini pig for us is the noise. Oscar makes noise most of the day, and many of his sounds are loud and disruptive. To hear what mini pig noises sound like, check out my post with sound recordings from Oscar. I am constantly amazed at how much sound can come out of such a little piglet. 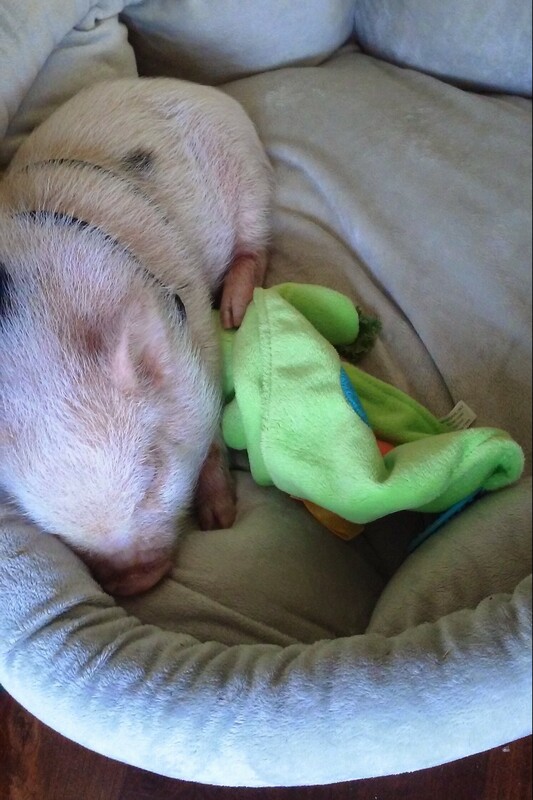 Of course, the worst sound is the initial squealing a piglet will do when adjusting to a new home. This happened for us when we tried to pick Oscar up or move him after a nap. Initial mini pig squealing is a tough phase, but the bright side is that the squealing eventually stops. Now that Oscar has stopped squealing, his loudest sounds are the squeaking/grunting ones he makes when he’s hangry (hungry and angry). For example, I normally feed Oscar dinner around 5 pm, although I vary it so he doesn’t expect dinner at a specific time. Oscar will decide around 3 pm that it should be his dinner time and will make his hangry noises until he is fed. I refuse to feed him when he’s being demanding to discourage Spoiled Pig Syndrome, so I must endure his hangry sounds until I’m willing to feed him. Just a note: I’ve tried turning the radio up to drown out the hangry sounds, but Oscar just sees that as a challenge and gets louder. Owning a mini pig is occasionally a battle of wills. On the brighter side, Oscar “talks” to us almost all day with little oinks and grunts; now that I’ve adjusted to those normal “talking” sounds, I find them cute. Also, since our first day with him, Oscar has slept through the night without making a sound. In fact, he is most quiet when sleeping, so we can keep him in our room at night without any sleep disruptions. Oscar sleeping quietly in his bed. 2) Stubbornness. The next con of owning a mini pig is their stubbornness. Pigs are smart animals, and that is a great quality except that it comes with stubbornness. To be blunt, Oscar pretty much does what he wants. Mini pigs don’t have the desire to please humans like dogs do, so they won’t do what you asked just for the sake of making you happy. They will, however, sell their souls for a treat, so you have to learn their language. We also work on training Oscar so that he learns basic obedience, which is our attempt at getting him to listen to us. I have learned to work with Oscar’s stubbornness by figuring out what makes him tick and by negotiating with him , but it’s definitely frustrating at times. Oscar getting a treat for good behavior. 3) Amount of Attention. The last mini pig con we have experienced is the amount of attention Oscar requires. This is a mixed one for me because I love spending time with Oscar, but the downside is that Oscar hates to be alone and mini pigs can become destructive when lonely or bored. Since mini pigs are so smart, they require more stimulation than other pets and have the ability to be purposefully destructive if they choose. All of this makes it important to spend plenty of time with them, being cautious to not spoil them. Before getting Oscar, I read that a mini pig’s time and attention requirement falls somewhere between a dog and an infant, and I couldn’t agree more based on my experience with Oscar. Most days this isn’t an issue and I have plenty of time and energy to spend with Oscar but, on days that are really busy or have unexpected errands pop up, I feel guilty and worry that he’ll be lonely or bored. Oscar loves to be held and will take as much cuddle time as he can get. There are so many pros to owning a mini pig that they outweigh the cons for us. 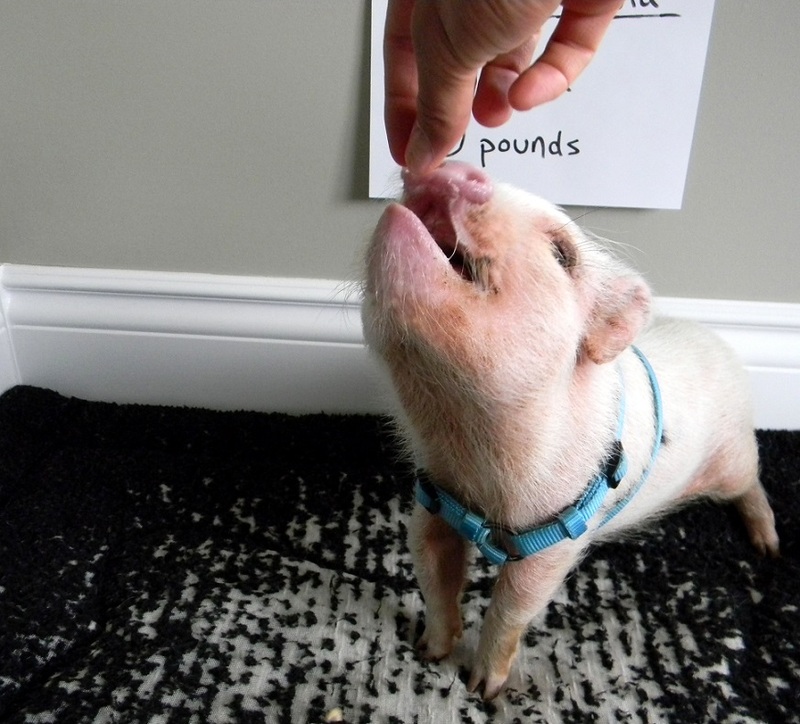 However, in deciding if a mini pig is right for you, it’s important to weigh both the pros and cons. While Oscar is just one mini pig, hopefully our experiences will help you in making your decision. As always, if you have any questions, don’t hesitate to let me know! If you can work through the cons of owning a mini pig, they can be wonderful pets and great companions! My mini pig Bella is 6 yrs old. I’ve been through all of the mentioned stages with her and love her to bits! Having said that, I discourage anyone who asks about her from getting one! Many babies are abandoned after they grow past that ideal size they were promised. Bella weighs around 100 lbs now. She never traveled well and finding a vet that wants to treat pops is difficult at best. Personally, I would probably do it all over again. The love of a pig is something so different from other pets that you just can’t explain it unless you’re a pigs mom. Keep up the good work your doing but encourage ppl to look at rescue sites before getting a tiny baby that’s going to grow up so fast! Hi Mendy! Thanks for writing and sharing about your experience. You have a great point about rescue sites. When we were researching mini pigs, I looked at several rescue sites and most were very honest about why pigs ended up without homes. It helped us to see the realities of the mini (and not so mini) pigs that had been abandoned, and it gave a very real picture of what owning a mini pig could turn out to be. Once we accepted that our mini pig could easily end up being over 100 pounds and could have a variety of behavior issues and we were okay with handling any of those outcomes, I felt like we were ready to get a pig. Like you mentioned, owning a pig is a challenge but incredibly rewarding, and I think it’s important that people commit to a pig of any size and the challenges that come with having few resources should medical or behavior problems come up. I appreciate that you are a loving mini pig owner who can love your Bella and still be honest about the realities of owning one. I completely agree that people should take a look at rescue sites as at least a resource before deciding to get a mini pig and appreciate your suggestion to use that as advice to anyone interested in a pet pig. Thank you! i think the biggest problem is people do nit do their research before buying a piggy. i went to soooooo many websites and rescues sites to get an idea of what i was buying and what the needs of my new pet/family member would be. I have had Pepe for 7 montys now and he is amazing-whether he ends up 100 or 200 lbs i would never gwt rod of him. When people pick a breed of dog they want they should know the size and needs of it before buying it. Mini Pigs are like having a medium to large dog in pounds-a good friend of mine bought from tye same breeder as me a few years back and her fella is 70lbs full grown and he is the same size as her english bulldog when they lay next to each other. Mini Pugs are special, intelligent animals with particular needs, but each pet has particular needs. whenever people ask about Pepe and how big he will get i advise he mom is 40lbs full grown and dad 38lbs full grown but i anticipate him to get to at least 70lbs if not a bit more—–in saying that pigs carry their weight differently so a 70lb or 100lb pig looks like a full grown english bull dog or stocky medium/large size dog. i would never tell someone not to gwt one but i certainly would educate that person on the realities of tye species before they actually buy a pig. they are so special and so worth it. Hi Kimberly! Thanks for your comment. I agree with you 100% about the biggest problem being people not doing their research. We also did tons of research before, and honestly I went into pig ownership expecting the worst and hoping for the best. I think because we were prepared and everyone in the family was completely on board, we have had a positive experience. Like you, I don’t care if Oscar gets to be 200+ pounds because we waited until we had space for him should that happen. Mini pigs are so smart, and owning a smart animal can be really challenging as they can easily outsmart us and get into trouble if they’re bored. It’s so important that people know to train them early and learn to work with their intelligence instead of fighting it. I am always hesitant to say this in case someone takes it the wrong way but, since we did our research and waited until we were ready and had space and time for a mini pig, we have had a wonderful experience that has been easier and even better than we expected. But, it’s so important to combine that with the fact that we researched mini pigs for years and planned for the worst (bathroom issues, stubbornness, rooting up floors and yards, getting into cupboards, etc) and have worked with Oscar everyday to train him and keep him stimulated and content. And we might have those problems in the future still. I worry about this so much with the holidays coming up and people giving mini pigs as gifts. The decision needs to be made by the person getting the pig and the entire family should be on board. I appreciate you bringing the education issue up because I think you’re completely right about it being the biggest problem. I’m so glad you’re having a great experience with Pepe. It sounds like you knew exactly what you were getting into and were prepared from early on to tackle any potential issues before they became problems. Pepe is lucky for having you since you were prepared and concerned first with his needs and what would make him a happy member of your family. Mini pigs certainly aren’t for everyone, but they are amazing pets for people who have done their research and know they can provide the kind of home they need to be happy. Thanks so much for sharing – I couldn’t agree more! Great comment! Spot on about everything, including rescues. Only about 7% of baby mini pigs that are adopted are kept for over a year. The others fill up shelters, which are too full to take on more. Thanks for speaking the truth. Hello. I have an 8 month old mini pig named Ringo and he is the sweetest thing, but I’m having an issue with training him. I’m a sucker for spoiling my pets. I make sure to not over feed him because I’m afraid of him becoming unhealthy but the issue is he squeals (when I’m home and not with him) for food or attention. Also his potty training isn’t going as well as all the research I’ve done said it would. Do you have any tips on how I can improve his training? Hi Tori! I really like the name Ringo for a mini pig. 🙂 He’s about the same age as Oscar, so it’s helpful that I can relate with that. Oscar also squeals some for food or attention when we’re home but not with him. It’s not all the time, but he definitely squeals about an hour before his meals and some at night if we’re not in the same room with him. Sometimes I think he squeals when he can’t find us, and it’s almost like an echo location thing. For the most part, we ignore it. We haven’t been able to stop him from squealing at those times, but we’ve reached the point where it doesn’t bother us too much. We’ve found that any attention, affection, or food when he’s squealing just teaches him to continue doing it, so our ignoring him is strategic. That being said, it’s not a perfect system, and there are just times when he squeals because he wants to be fed. I’m hoping with time and as he gets older, the squealing will decrease or stop altogether. I would recommend ignoring Ringo when he’s squealing for food or attention, and see if he learns that it doesn’t get him what he wants. As for the potty training, I’m not sure what the specific issues are, but we have weeks without accidents and then will go through periods where Oscar slips a bit in his potty training and we have to figure out what’s going on. Our latest one is that Oscar didn’t want to go outside because it’s cold, so he was sneaking into a corner in the house to potty quietly. So, if Ringo goes potty outside and you are noticing more accidents due to bad or cold weather, that could be part of it. Our solution any time we have accidents is just to take some steps back in our potty training or even pretend like we’re starting over. So, we’ll take him out on a very regular schedule again, make sure he’s in his routine since an irregular daily schedule can throw him off, go back to crate training some where he stays in his crate when we can’t keep an eye on him, and anything else that helped us structure his potty training in the very beginning. So far, that’s worked really well. Of course, make sure he doesn’t have a UTI or some other medical issue that would interfere with his potty training. Also, you might know this already, but I’ve read that mini pigs don’t have complete control over their bladders until they are older (9 months old or so), so hopefully Ringo’s potty training naturally improves a bit once he can hold his bladder longer. Hope some of this helps with Ringo! Feel free to let me know if you have any other questions! Thanks for sharing this! I think this is a great alternative during the colder months and will be helpful for a lot of piggy parents looking for an alternative solution! Anyways, No I didnt research a pet mini, wasnt my ‘plan’. Ha ha ha I am a sucker for his cute lil snout and his waggle tail. Thankfully, I own my own home (under construction, he dont mind the power tools, LOVES the cords tho) Im also on 2 acres, so should he get to be huge, I can accomodate his needs. Anyways, please dont judge, LOL! I love my pig. Hi! Thanks for sharing your story! I was a little nervous reading your comment, but then I laughed when you wrote that you took him to the vet for his neuter and that he now has full run of the house. He has really worked his way into your heart! I am so glad he has found a loving, happy home, even if it was unexpected. Funny how they come to “own” us, isn’t it? They say “dogs have masters; pigs have staff” and that is pretty true! Just to address the first part of your story when you got Beau, I think it was brave of you to share that honestly on here. As you said, that might anger some people, but I don’t see it as being much different than anyone who buys pork from the grocery store; the only difference is a lot of people aren’t willing to really face where their meat comes from. I don’t eat meat but did for years before making the change, so I try to remember that everyone has a different stance on it. And, in the end, Beau has touched your heart (and your son’s!) and has found a loving home. On the potty training issue, I didn’t litter box train Oscar, so I don’t have direct experience to share with you on that. However, I have a few ideas that you can try. First, make sure the area where Beau is going potty in your bedroom is really clean, and I recommend using a cleaner that also uses enzymes to remove the smell. Once pigs find a spot to go, they will continue to go there if there is any scent left over at all (even if it’s so little that we can’t smell it). So, that would be my first step. Another option is to put a piece of furniture or something similar over the spot where he’s been going in your bedroom. The goal here is to take away their access to the spot that they like. It’s possible he could just go next to where he’s been going, but there’s a chance the situation will improve if he can’t get to his favorite spot. My last suggestion would be to just not give him access to your bedroom in the morning until he’s gone in his potty box. This will likely be inconvenient, but they are pretty quick to train so, if he learns that he has to go potty in his litter box before he can go to your bedroom in the mornings, he might learn to do that and then come see you after he’s gone already. Here’s an article on mini pig potty training that might be helpful in case you haven’t read it already: http://www.pigs4ever.com/pot_belly_pig_information/litter_box_and_potty_training.php. I also understand after you clean the spot where he goes potty if you put a bit of food there he will no longer see it as a spot for going potty. I just got Wilbur yesterday and he is 8 weeks, he wants nothing to do with anyone, but me. He gets upset if he’s not in my lap or not holding him. I don’t mind, but I know of I continue this it may become a problem later. I’m not sure what to do because I want him to feel comfortable, but staying nudged with snout in my neck or lap can’t last forever lol. I’m already loving this lil one so much. He won’t let anyone else even hold him without squeeling like crazy. Hi! I am interested in owning a pet pig. I’d like for the pig to be house trained. I have been doing a lot of research and have been trying to weigh out the pros and cons of getting one. I am an RN that works the nightshift which is 3 12hour shifts in a week. I sleep during the day and i am up at night. I worry about if i got a pig if it would get bored or lonely. My boyfriend, who I’ll be living with soon owns a dog and it’s a male lab. He’s about 1 year old, but he’s pretty big and full of energy. I have talked to a couple of people and they have dogs along with their pig, but they are always supervised and never left alone. My concern is will a pig and a dog this workout in a household. Obviously I understand that feeding them separately is a must for safety reasons but can they live harmoniously? Another concern i have is if I decide to have children. Is this pig going to charge at my children? I’ve heard this happening because they are trying to dominate the weakest person which would be the child. That’s kind of scary to me. I’ve also heard of them charging at people that come in your house. Are they loving and want to interact or do they keep to themselves?? I’m trying to figure out the relationship bond everyone is talking about. Hi Priscilla! All of your questions are good ones and unfortunately, as you already know, don’t have easy answers. However, your questions show that you’re really thinking about whether a pig is right for your home, and that’s awesome. I think that some dogs and pigs can live harmoniously, but I agree with the others that they shouldn’t ever be left alone unsupervised. Even with Oscar and our dog, their relationship has changed several times over the past 10 months and they can go from friendly to enemies quickly. The trouble is that pigs don’t have many defenses, particularly against a dog, and will easily lose a battle against a dog. To make it worse, a lot of times pigs are stubborn and will instigate a fight they ultimately can’t win. So, unfortunately, based on my experience, I wouldn’t ever leave a pig and a dog together unsupervised based on the safety risks. One thing to consider with your schedule is that pigs can become very routined. Oscar knows what time of day it is better than I do, and he will sometimes scream if he doesn’t get fed on time. My concern here is more for you and your sleep if the pig decides he is hungry or wants something while you are sleeping and keeps you awake. Although, if your boyfriend is able to keep a more routined schedule with the pig and help with that, it might not be as much of an issue. Just something to consider! Oscar used to sleep in, but these days he wakes up around 6:30 or 7 (even on the weekends) and sometimes screams until he is fed at 8 am. We have tried several behavioral changes to get him to stop screaming so that we can sleep in a bit on the weekends, but we haven’t been able to stop it yet. I don’t have children, so I don’t have any direct experience with children and pigs. However, what you’ve read is definitely a possibility. That being said, a lot of people have children and pigs and they do well together. One thing I would mention if you do have children and are having charging issues, Move the Pig is an option but would need to be used by every member of the household so that the pig doesn’t think he can dominate the weakest one. Oscar has been good with some brief visits with our nieces and nephew so far, but that’s all the experience we’ve had at this point. Thanks for doing your research and really thinking through all of this! It’s definitely a tough decision! Thank you so much for your quick response and advice!! You’ve given me a lot to think about. I believe eveyone will have to be one board for this to work out. I have heard of move the pig and heard it was really effective with showing them their place in the household. Since they are really demanding and scream when wanting food that’s one thing that I’ll have to definitely think about. Not sure how my boyfriend and i would like being woke up. It truly is like a baby. I’ve heard not to give in to their screams to teach them that screaming will not get them fed but I’m sure it comes down to how much your eardrums can handle. Thank you again for your response! 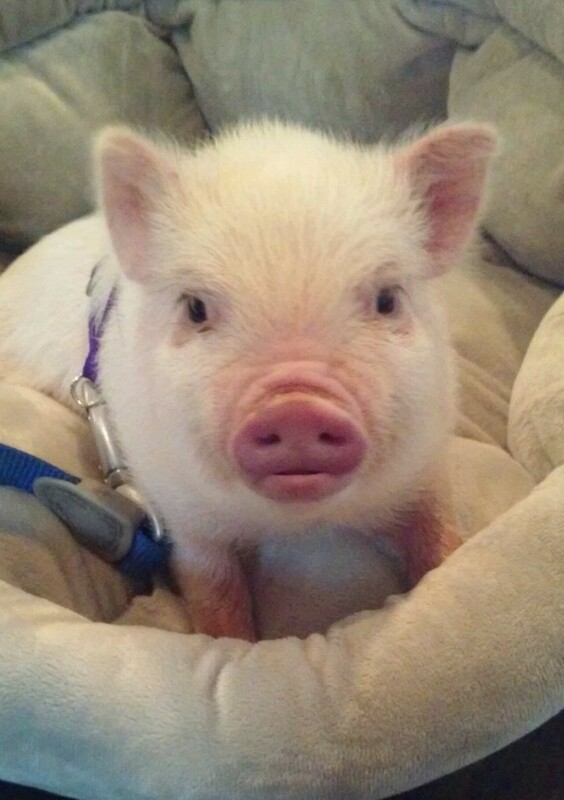 Hi, my mini pig Norma Jean is about 2 1/2 months old. She was doing so good with sleeping through the night but now she wakes up through the night screaming. We try to ignore her but it gets so loud that we just enough up getting up. This has been going on for three nights so fare. It wouldn’t be so bad if I didn’t work every day. I love her so much I just don’t know what to do. When she wakes up during the night it helps if you touch her. She was recently with her real mommy and is still a baby. I have a 5 month old named Maia but I have to get rid of her if we can’t her to stop squeaking we have gotten use to the screaming and grunting but she is CONSTANTLY squeaking and we can’t figure out why or how to stop it. One bright side is that, in my experience, Oscar makes fewer noises now that he’s a little older. He was pretty noisy as a baby and still can be at times, but he makes significantly fewer noises these days and is relatively quiet unless he’s mad or wants something he isn’t getting. I’m wondering if Maia is trying to signal something to you or what she’s trying to communicate with her squeaking. Hello, I have a mini who is almost 4 months old. I wonder if the squeaking you are talking about could be that she is teething. My mini Rosie makes that sound too but I read that it is teething, and just like a baby they are in pain and try to relieve it by grinding/ squeaking their teeth. My vet said that if she seemed really uncomfortable or in pain to give them a half of a baby aspirin and see if it helps. Sometimes I give her part of a frozen treat too made of yogurt, cranberries and orange juice all blended and frozen. I haven’t tried the aspirin yet but read or search it. Eventually it will stop. Hope that helps. What a great blog. I am a new mini pig owner. My husband bought him for me for christmas. I was thinking of buying one, went to look at the batch. Choose Babe and then decide not to go through with it as it is such a big responsibility. I was sad about my decision but thought it was the right one. Well on christmas eve while Father Christmas is handing out presents out came Babe. I was over the moon with joy and knew it was mend to be. Babe is only 4 weeks old. The first morning she tried to bite me when I wants to pick her up and it scared the hell out of me. Lol I knew we had to bond so I just sits on the floor and he came crawling on my lap, laying there for times on end. His first bath went great with hubby’s help as I was still cautious. Third day today, he do his potty thing outside as I took him out the moment he wakes up. I still have a lot to learn and will most certainly ask for help when needed and keep you posted how Babe is progressing. I love him to bits in a very small time! My jack russell of 9 years is still jealous and will snap at Babe but it does’nt bother Babe at all. I googled about mini pigs and the most important tip is to sterelised them as small as possible as on 6 weeks their hormones start kicking in. That stops that problem and also their potty smell is less odour and they stay smaller. Let’s hope!! Hi there! I’ve loved your blogs! I was getting discouraged until I read your postings. My piggie, Charlotte, has been in our life a little over 3 weeks. She is finally coming to me when I call her… but still runs or darts when I reach for her (even slowly!). She squeals madly when I pick her up…. even for a while after I sit down and hold her (with a blanket). Does this get better??? The squealing is ear piercing & I just thought it would go away after she “got used to” being picked up. We got our little pig a week ago and same thing, squeals terribly when we pick him up. Also, he piddles a little bit when he gets so worked up. Which, I’m sure you’re well aware, smells AWFUL!!! We are trying to litter box train him because I currently have 4 foot snow drifts in my back yard. So far, to no avail. Oh goodness! so you feel my frustration! I just want Charlotte to come to me freely… wonder how long this will take?? I can get her to come to me when I have a treat in my hand, but as soon as the treat is gone, she darts! not sure if you have read some of the mini pig books or sites like pigs 4ever but gaining a pigs trust takes time. i had to get on the floor and sit with my first one for weeks hust giving a cheerio here and there until he learned. 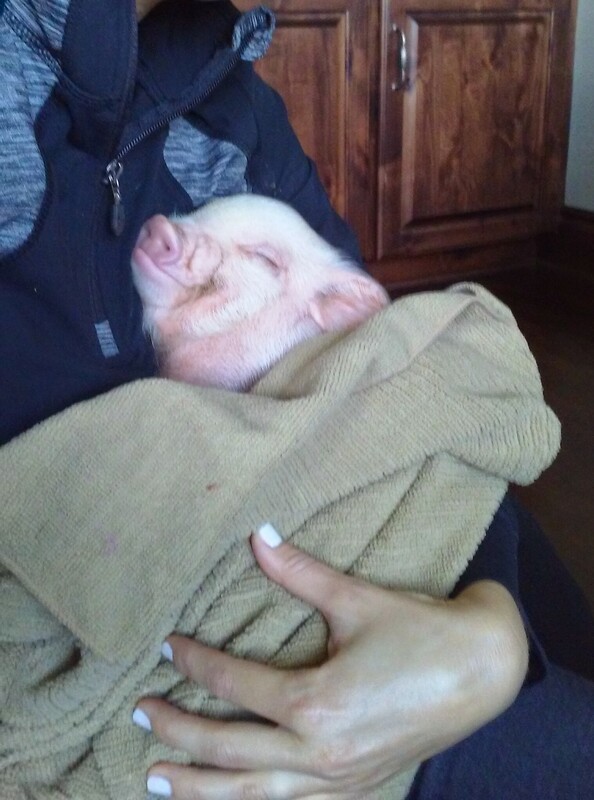 i was able to snuggle my piggy in two weeks but picking him up took much longer and he had been socialized for weeks by the couple who bred them. petco or pet smart- put a plastic bag over it and put some wood chips in it. then put a poo poo pellet in it. my pig was trained in two days by doing that. even now (my two are almost two years old) and i have a plastic container from tractor supply with a bag and chips and they go in it sometimes i am at work- they try to hold it until i get home bc they prefer to pee n poo outside…but sometimes when it is colder out (even though they live inside) they will pee in their liter box. easiest animal inhave ever liter trained- but i have read that before a pig is neutered it is a little harder to liter box train them. not sure bc both of mine where fixed b4 i brought them home. So when I’m at school for 9 hours will my mini pig be bored? yes, unless you give him/her activities to do. i actually bought another pig so my pepe would not be lonely. some of the sites like american mini pig association, pigs forever, and many mininpig books help give lots of great tips. We just got a young mini pig (just turned 3 weeks old a day ago) and besides the usual expected problems we have one that really has me worried. For the past two nights that we’ve had her, every time she wakes up in her kennel she starts making a grunting squeal that gets louder and more excited until one of us comes over and comforts her. How do we handle this when both of us are at work? I am worried sick about her being terrified while both of us are gone. Generally, they aren’t supposed to leave their mom until they are 8 weeks old. When we first got ours she would do the same and we had to put her in bed with us. After a while..maybe they get used to being with you in a new environment and you can start working to get her to sleep in her kennel. They also love to burrow and are used to sleeping cuddled up with brothers and sisters and mom. We have several blankets in our minis kennel that she likes to bury herself in. Just keep working with her. She should get better as she becomes used to her new surroundings. It just takes time. I need help. So I just bought my first mini pot bellied pig. And I’m not going to lie. She’s a brat. She is 8 weeks old right now. (I’ve had her less than 48 hours). When we went to pick her up she was perfectly fine no squealing or anything like that and now that we are home we try to pick her up and she doesn’t stop squealing. I’ve held her for over 30 minutes and she hasn’t stopped. Finally I just set her down and she immediately goes quiet and lays down or does whatever she wants. Idk what to do. PLEASE HELP!!!!! Mine was doing the same now I put him his kennel when he decides to throw a tantrum. I’ve found he does it more so when he is hungry. Hangry seems to be a very big thing with Wilbur because when he is set down he can scrounge around for food or can nibble on his blanket. Hope this helps. So what I’m hearing is that it’s because she might be hungry? Surprisingly, yes! That’s what it was with my little guy. Then he wouldn’t eat so I had to spread food around his kennel so he thought he was searching for it. Good thing g was he seemed happy to be looking & helped him to be moving around. He still has his tantrums, bit not near as bad. I took it to heart at first then I realized he just wanted something else and in his case it was more food. You need to get on a pig board on Facebook immediately and educate yourself on feeding and behavior. Many breeders will have you underfeed to keep them small. That never works, it just damages their organs if they survive the starvation. You are also handling the pig way too much. He needs time to feel safe and adjust. Please start researching everything right away. Only about 5% of pigs purchased remain in their homes. Rescues are flooded and most don’t have room for any more. Dog food is awful for your pig!!! You need to stop that immediately!! Mazouri is what I feed mine and get it at Ace Hardware. He loves to eat, but he has about 1/2 cup in am and 1/2 in evening plus like I said I hide pellets for him all over so he is still scrounging and feed him snacks like carrots and lettuce, little apple pieces. He gets treats for going potty outside and treats because we love him. Dog food is awful. Just Google Mazouri pig food….even the Purina pig food is not good!! I actually bought a 25lb bag of mazuri 0-4 months of age youth pig pellets. She won’t eat them. Any idea how I get her to? Stop the dog food she will eat them when she gets hungry enough as bad as that sounds, won’t take long. Then as I do also hide a few. I’ve also heard moistening the sometimes will help, but to be honest other than that I’m not sure. I’m a new pig mom also, but I read up and watched a million YouTube videos before I got Wilbur to be sure it was a good match for our family. Mix with applesauce to start. You’ll want to wean her off the applesauce with food asap though. You’ll also always want to serve the food mushy with water. Contradicting myself here, but you may also want to try scattering the dry pellets on the floor. Her rooting behavior will most likely kick in and she’ll eat. She also needs water down at all times. I’d put the food/applesauce mixture down or scatter the pellets , let her see it, then leave her alone to de-stress. When you do interact with her, try to crawl on the floor closer to her level and let her come to you. Most pigs hate to be picked up and held. Pigs are prey animals so hate being off the ground. Food wise make sure she’s eating about 2-3% of the recommended growth, she should get lots of veggies as well–find it online at Mazuri. My pig gets feed for breakfast and dinner, a huge salad for lunch, and canned pumpkin for night snack. We train with Cheerios and he has a rooting box where he roots for oats. He also gets outside a minimum of two hours a day where he can eat grass and root. They need nutrients from soil. You want to decrease the food if she starts getting too fat as it’s hard for them to lose weight. A Facebook pig group is really going to be your best friend. You’re going to have a lot of questions the first few months. Mini Pig Info is a good group. I need all the info i can get i just got a baby pig!! I went a hour away to get her! The lady says she is around 2 weeks old! I dont know why she weaned so earlier! She told me to get a pig milk suppliment! Witch i did but my piggy wont drink it ive tried regular baby bottles an everything! An everytime i pick her up she freals out an squeelllllzzzzz! My spencer is great and he is 7 weeks old but he only roots me bad. How do i get him to stop? I have enjoyed reading this feed, and gotten a lot of tips, I am a new mini owner and my baby’s name is Mary Jane. She is now 8 weeks old and I have had her a week. She comes to me and let’s me pick her up and she is good about sitting in your lap or cuddling, but when you move her or put her in an uncomfortable position she squeals like crazy and I try to hold her until she calms down because I don’t want to enforce negative behavior. Is that the right thing to do? Or should I put her back where she is comfortable. I want to be able to flip her on her back and handle her as best as I possible can to avoid issues in the future. Thank you! I am a new mini owner, and she is my first pig. Her name is Mary Jane and she is now 8 weeks old. I have had her for about a week and she seems to be doing really well. She comes to me when I call for her and loves to be in my lap and cuddling. She does okay when you pick her up, an occasional squeal but nothing crazy. She is eating well and using her litter box well, but the only issue I am having is when I put her in a position that she deems uncomfortable she squeals like crazy. I try to keep her in that position until she calms down, because I don’t want to enforce negative behavior by just putting her down. So I guess my question is should I just let her scream it out? I just want to make sure I can handle her as she grows into an adult pig, but I don’t want to scar her either. Oscar sounds like a great mini pig! I hope our mini pig will be like that! Right now she is 3 weeks old. We just got her and we noticed that she often begins to just randomly shiver and shake. She doesn’t seem in any pain or worried but I just wanted to get someone’s opinion. Do you think Tulip has PSS? Forgot to say Petunia got injections for sacroptic mange (common in pigs-who knew? ) and wormed on her first trip to vet. And also, thank you for this site! Wish I had found earlier but glad found it now! Great resources!! I agree on everything and my Wilbur-Woo, pees every day!! In my lap, while eating, in his bed. I love him but OMG it’s overwhelming! Very stubborn too and will hurt your feelings when you try to bathe them and they scream at the top of their lungs. I recently got my sweet girl Maybelle. She’s great during the day, plays very well. She has her stubbornness when she wants food and still squeals when being picked up. But at night she squeals. I feed her before she is put in bed so she’s not hungry and has constant supply to water. So can I get her to squealing at night?